To purchase yours now for just £9.99, click on the image. Originally developed for U.S. Military applications, X‑Treme Tape has been tested and proven in the most extreme conditions and environments. It is the most versatile and easy-to-use quick-fix emergency rescue repair tape available. 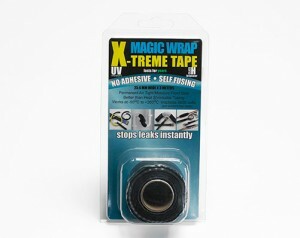 X‑Treme Tape withstands extremes in temperature, pressure, voltage, moisture, corrosion and contaminants. Tests show the bonding strength of X‑Treme Tape greatly exceed the Mil-Spec standard and that of competitor tapes. To purchase yours now CLICK HERE! X‑Treme Tape will seal and repair plumbing, vents, ducts, and hoses. It can even choke-off a vehicle’s leaking radiator hose! Use X‑Treme Tape to insulate electrical connections and make them air and water tight. Makes heat shrink tubing virtually obsolete! X‑Treme Tape‘s strength comes from both its thickness and the advanced bonding characteristics of the special silicone formula. X‑Treme Tape has about 15% more material/thickness than rival brands making it the most reliable product available! Resists Acids, Fuels, Oils, Solvents, Salt Water, UV Rays!